Excuses, excuses, excuses: The Eurozone crisis, weakness in the US, or the wrong type of snow? Alex Hern rebuts the FTs claim that the low growth the UK is experiencing is due to matters outside Osborne's control. The Financial Times has responded to our November article in which we broke the news that George Osborne is set to borrow millions more than he slated Alistair Darling for proposing to before the election. This was always likely to be a tenuous claim to make, as comparing Osborne’s 2011 plan (the black line) with Darling’s 2010 plan (the red line) was pretty unfair. Even if Labour’s plan had less impact on growth and so resulted in a smaller increase in borrowing, it is fanciful to think that given the eurozone crisis and weakness in the US, the economy would have grown at the rate being forecast in 2010 if they were in power. The error in estimating the size of the policy impact would have to be implausibly large to lead one to conclude that borrowing would actually have been lower in the absence of the additional tax rises and spending cuts that have been announced since May 2010. It is important to note that all these discussions are based, broadly, on the same model, the OBR’s, which links growth and the deficit. Using that model, the facile conclusion is that more taxes and less spending will lead to a higher deficit, unless the increase in growth is enough to counteract that. The IFS accept the OBR’s estimations of the growth impacts of all the governments policies, and conclude that the OBR would have to be very wrong indeed for Labour’s plan to have led to less borrowing. And it’s not like that’s ever happened. 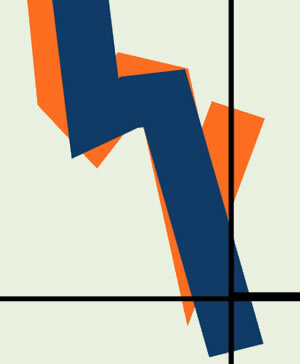 For the FT’s argument to hold water, the unique stagnation experienced from the fifth quarter onwards would have to be entirely due to an external shock, one which a Labour government would have suffered equally from – the Eurozone crisis or weakness in the US, for instance, or the wrong kind of snow. The problem they have is that slowing predated their preferred excuses, the Eurozone crisis and the weakness of the USA. The UK basically stopped in growing Q3 2010, but the rest of the world carried on for quite some time. Indeed, both UK exports to the Eurozone and Eurozone growth were higher than the OBR predicted, and neither of them helped shrink the deficit. The UK is unique in experiencing this stagnation, and the Eurozone simply could not have caused it. 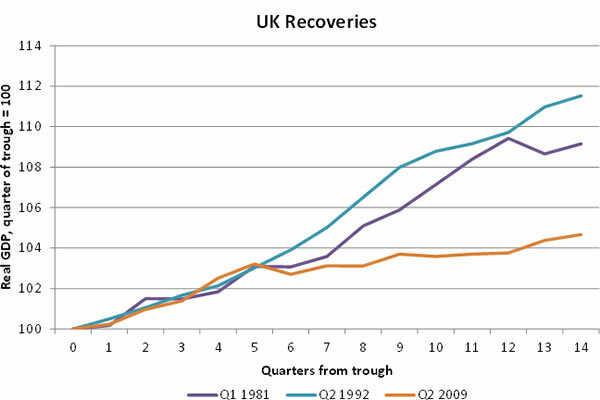 The international events are not sufficient to explain the five per cent difference between the recoveries in 1981 and 1992 and the stagnation now. Neither, unless you are George Osborne, is blaming transient national events like snow or a wedding. The onus is on the FT to explain why the UK experienced poor growth a year before the USA, Germany, France, or the Eurozone as a whole. If they cannot do that, then they must accept that it is due to the cuts and their damaging effect on demand, as has been detailed on these pages ad nauseam. And a five per cent difference in growth is, according to George’s Marvelous Deficit Calculator, a 4.8 per cent difference in the deficit. Easily enough to leave the Darling plan ahead of the Osborne reality, Eurozone crisis or not.